Meet the Lesley in Lesley's Girls. NB- I feel it's only polite to point out there is a misprint in the date as the picture was taken some 10 years later (more like 1970)... not sure my mum would have appreciated being aged ten years! If you have read our about page you'll know we named our shop after our beautiful mother Lesley, who passed away when we (Susannah, my brother and I) were children. We obviously miss her very much but we always look to her as an inspiration to living your life to the full, and following her most important maxim- to be happy and help those around you to be happy. 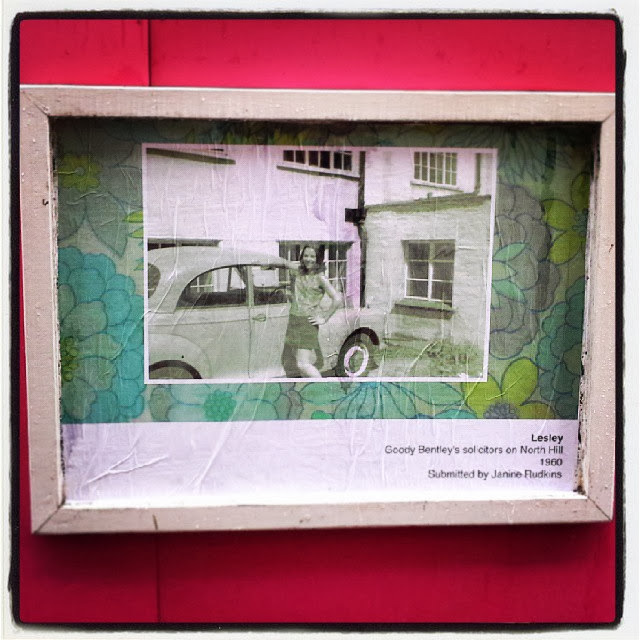 Recently The Secret Vintage Fair (which we jointly organise with Lullabelle's Treasure's Lucy Craymer) teamed up with This One Wall and the local to community to fill the external exhibition space on the hoardings outside the two main art galleries in our home town, Colchester. Submissions were asked from the public of local people showing historical or vintage fashions. And so we asked our father to look through old photos to find a suitable one (something he no doubt loved having an excuse to do again and flick through photos of mum and us children growing up), and we were pleased to find this one and to get the opportunity to have it included. I feel very proud to see it there, and will make sure I detour that way every time I come to town in the month of November to see my mum's smiling face- which is the way we all remember her. The exhibition will be up for the whole of the month of November, and The Secret Vintage Fair takes place on Saturday 30th November in Colchester. If you want to read more on the This One Wall project please visit the page here, and look out for a further blog post from The Secret Vintage Fair later this week here.